ELWA‘s history began in 1931 when Dipl. Ing. 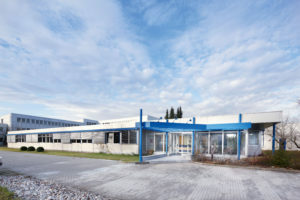 Anton Hilpoltsteiner bought the electrical department from the insolvent assets of a Munich-based company, banking its future on building electrically heated devices. In the early years, ELWA produced electric cookers for domestic and industrial applications. The development of electrical continuous flow heaters was also set in train in this period. In addition to series production at that time, ELWA also offered its customers special fabrications for specific applications. The electrically powered on-board galleys for Zeppelin airships were developed and produced by ELWA. At the start of the 20th Century, the electrical industry was still something rather exotic, but it soon underwent significant growth and the family firm, ELWA, also profited from this development. The company came through the Second World War without suffering serious damage, and was able to resume normal operations smoothly at the end of the conflict. 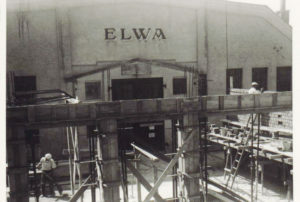 The need to provide equipment for private households and the production industry meant that ELWA enjoyed full order books, making modernisation and expansion necessary. In 1962, the old production hall and the villa dating back to the founder‘s time were linked together by a modern administrative block. In this period, the two most important branches of the business were building canteen kitchens and producing continuous flow heaters for ship-building and industry. In 1971, A. Hilpoltsteiner Senior died and the company passed into the hands of his daughter Hedwig Hausler and son A. J. Hilpoltsteiner, who became the Managing Director and guided ELWA through the 1970s and the difficult times in the 1980s. Two important decisions were taken during this period: production was expanded to include the areas of plant construction and switch cabinet building. Ever since 1985, switch cabinets, pumps and heaters have been combined into efficient systems. The success of reliable ELWA products fuelled international interest in technology ”Made in Germany“. Contacts and business links were forged throughout the world. ELWA established itself as a strong, innovative company in the international market. By 1988, ELWA had become a standard supplier for many engine manufacturers and IT systems began to be introduced. The preheater area continued to develop further. Important cooperation deals such as with fuel module manufacturers secured the market position. In 1993 and 1995 the development of control technology and plant construction was pushed ahead decisively. The product range was extended time and time again. In 2002 A. Hilpoltsteiner passed away unexpectedly, at a sadly early age. Today the company is managed by Dipl.Ing. (FH) Markus A. Hilpoltsteiner in the third generation. Canteen kitchen construction, which had up to that point been a second pillar of the company, was abandoned. The company grew, enjoying increasing success. Quite soon, the production facilities on Munich‘s Landsberger Strasse had become too cramped. 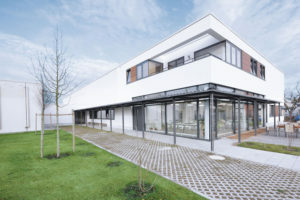 At the turn of the year 2008/2009, ELWA moved to its new facilities in Maisach, located on the outskirts of the Bavarian metropolis. On a production area of 6400 m² with the latest working conditions, excellently trained employees manufacture ELWA devices for shipbuilding, industry, energy systems and motorsport. Flexible, fast and reliable – the right solution for all requirements.